Hi all, I was hoping that someone here could give me their expertise on how to make a DIY "Horror Hawk". That is, a short mohawk wig with the "hair" (foam, tubing, etc) attached to a center strap and then secured with a strap that goes around the head. The following image shows the basic design. I'm guessing that I will simply use elastic straps as the main attachment. As for the actual "hair" and style, I would like something that looks similar to this image. It doesn't necessarily have to be tubing, as long as it's stiff enough to be relatively upright and wild looking. Any suggestions on what materials to use, how to attach the tubing/foam, and how to get it to point upwards? I'm actually considering starting to make them since it's so hard to get a Hair Surgeon one now days. I figured that you'll need elastic or some form of strong fabric to mount the foam strips on. I plan to use flat crafting rivets to secure the materials to the elastic/fabric. It'll take a bit of prototyping, but a few friends of mine are begging for one! A few of my friends actually have the Hair Surgeon/Angelspit horrorhawks and they are extremely awesome. As for other materials, I wouldn't know how to attach tubing like that, unless you sew it on. You can sew 5mm tubing onto elastic. 5mm tubing is fairly stiff, so I assume it'll stay up and you're probably best off actually sewing the shape of the tubing into a hawk. Last edited by guest123 on Sat May 09, 2015 9:14 pm, edited 1 time in total. rivetlicker_ wrote: As for other materials, I wouldn't know how to attach tubing like that, unless you sew it on. You can sew 5mm tubing onto elastic. 5mm tubing is fairly stiff, so I assume it'll stay up and you're probably best off actually sewing the shape of the tubing into a hawk. I wonder if it would be worthwhile to use some sort of plastic spike rivet to attach the tubing? Otherwise, I think that I will try sewing it on. Another thought is that if the tubing is too heavy, the hawk might fall right over. I guess I can try using a stiff backing to prevent this. Or, switch to foam instead. Any suggestions on where I can find black and various shades of red, (light weight, yet stiff) 5mm tubing? stinamoo wrote: Best way to get synth dreads or tubing to stand up is to ponytail it up. Several ponytails for a 'hawk, I guess, but you can see where the guy in the photo has a band round the tubing to help it stay up. I think those spikes JUST might work! Just make sure you have the right length though. I figured to get 5mm long ones because elastic or material + 2mm foam could range up to that. I'm guessing you could try PVC tubing used in electronics. It's more hollow than smooth tubing, the craft stuff. I remember using silicon tubing at my old work. It was very expensive though. As with all plastics, weight. Due to both a lack of time and artistic skill this might take me a while to actually build an attachable mohawk. 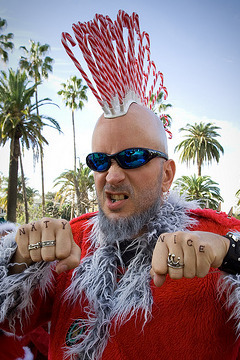 In the meantime, I thought I would add this candycane mohawk that I came across. I'm guessing he used spirit gum or something to attach it, or maybe the circular shape of the plastic holds it in place. Something to keep in mind as an alternative way to build an attachable hawk. Wow that's a bit Christmas crazy! Well he's obviously used spirit gum to attached the plastic base to his head. It's almost like some kind of electrical plug base, which of course would have had the candy canes glued in too. It's certainly got to be a pretty strong spirit gum to attach a piece of that sort of weight to his head. I'll have a think and see what I can think of which could be used to make something like that. I won't say how I did it, because well, that's now my method, but here is a crappy photo! Holy crap that is cool! It looks like a sculpture. Lovely work. You must come to the states sometime and go to Burning Man. Crash at my place and we can all pack up the camping gear drive to the Playa. I'm going to be in so much trouble... My friend actually sent the pic to them. For one, I don't intend to sell it and two, I'm going to have to change the design it anyway. They eyelets are in there to look more cybery. I wanna try it with glitter foam or something more out there. I intend to visit the US one day. Try and visit as many cities as possible to see all my hair friends!